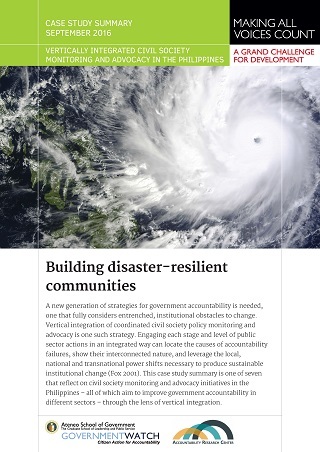 This case study summary looks into the advocacy campaign of the Disaster Risk Reduction Network Philippines (DRRNetPhils), which was directed at the passage, implementation and review of the 2010 Disaster Risk Reduction Management (DRRM) Act. The passage of the DRRM Act took more than a decade of patient and persistent engagement with the legislative process. While there had been earlier campaigns by various groups, DRRNetPhils is widely credited as being a crucial advocate for the passage of the DRRM Act. It provided a strong, broad, persistent and consolidated network that influenced policy. This summary is one of seven that reflect on civil society monitoring and advocacy initiatives in the Philippines – all of which aim to improve government accountability in different sectors – through the lens of vertical integration.